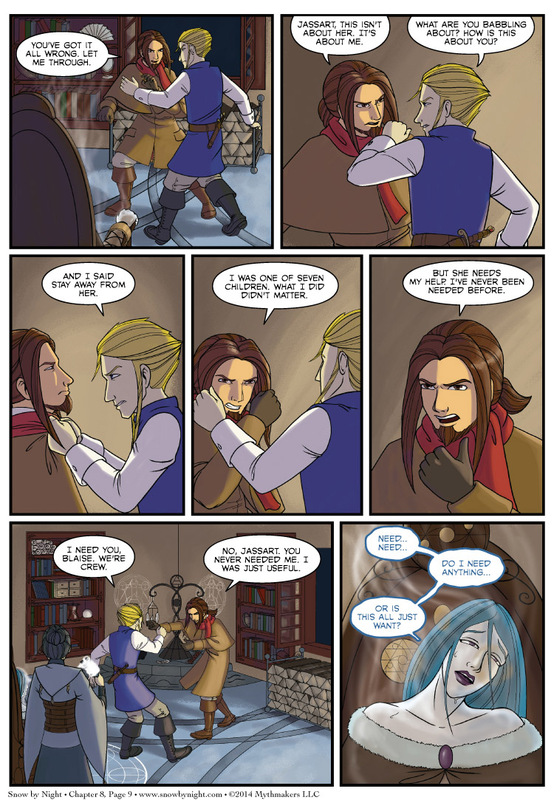 Blaise and Jassart discuss the importance of need on Chapter 8 Page 9. They best hurry and work out their differences. Snow-by-Night is melting away. To see a preview of the next page, please vote for Snow by Night on Top Web Comics. The SpiderForest Webcomic of the week is Lapse. Join Bianca Fortune in her adventures through the haunted world of ghosts and other spirits as she struggles to reconnect with her still-living body. Lapse updates 1/week. The art is lush. Ohayocon is coming. Come see us! Well, come see Brittany. I won’t be there, as kid #2 is due soon. Then, Jassart! Get up from behind him and cut that idiot’s throat. Then they’ll both be dead. Problem solved. Dude, what the hell? You’re commenting on literally every page hating on Snow and Blaise. Did you have a bad experience with a winter manitou or something? Every page is Jassart-hating. Whats actually wrong with Blaise-hating? I think he’s an idiot, I don’t like him, and I say so. Yeah, pretty much. His hate gets really boring after a while. Oh, man! I just now noticed that she’s turning transparent! Hurry, Blaise!